If you’re a lover of J Dilla’s music and/or trippy visuals, you’re going to love The Dilla Dimension. If your eyes can take it, you’re sent on an interactive, seven-minute ride through the donuts of time, accompanied by the relaxing sounds from Dilla’s masterpiece, Donuts. With vibrant colors and graphics moving in front of you like you’re trapped in a cool screensaver, this site is the perfect distraction for hip-hop heads. 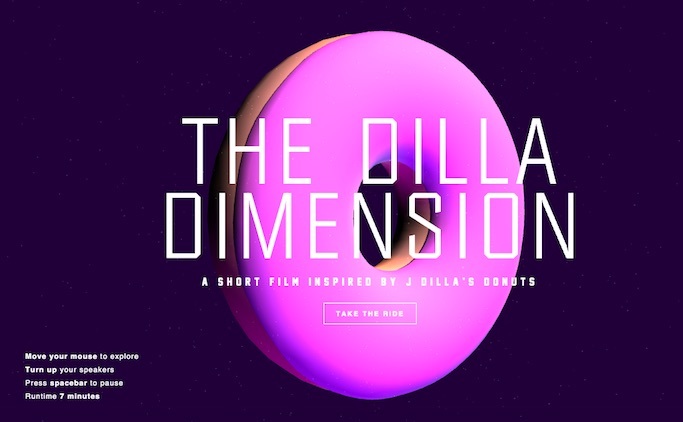 Although it almost feels like an online game, The Dilla Dimension was conceived as a “short film inspired by J Dilla’s Donuts,” detailing the story of two souls’ journey through outer space, according to the site. Viewers can click and drag their mouse to alter direction and guide the journey, and press the spacebar to pause the fun. Once paused, the site displays a timer to let you know how much fun you have left in store.